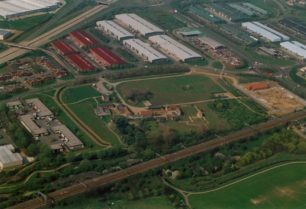 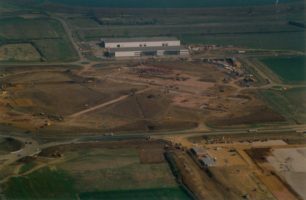 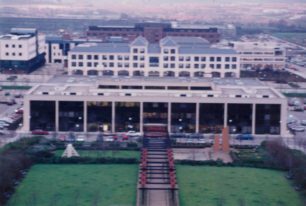 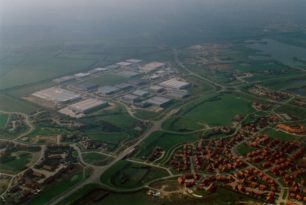 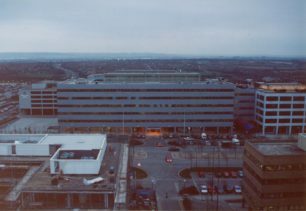 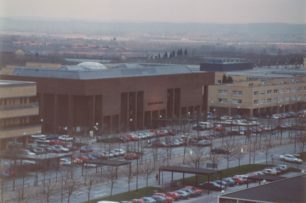 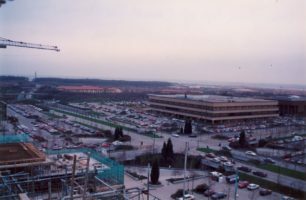 Photographs of Central Milton Keynes, the City Church and Woodhill Prison under construction, and of other areas of Milton Keynes. 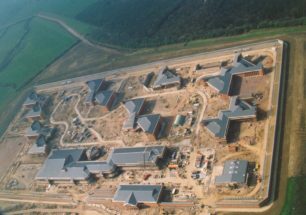 HM Woodhill Prison under construction. 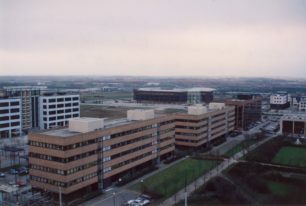 Acorn House (left) and Midsummer House along Midsummer Boulevard, CMK. 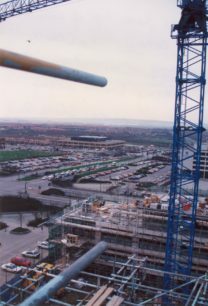 Taken from top of Christ the Cornerstone Church during construction. 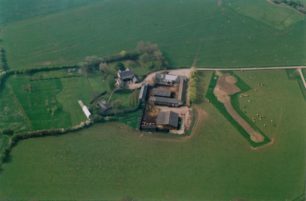 View of a group of buildings in an unidentified area, possibly farm buildings. 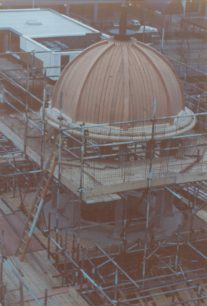 View of dome of Christ the Cornerstone Church at a later stage. 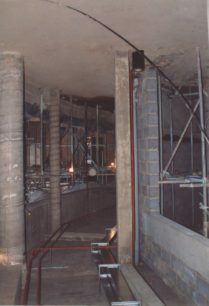 Inside the cloisters of Christ the Cornerstone Church during construction. 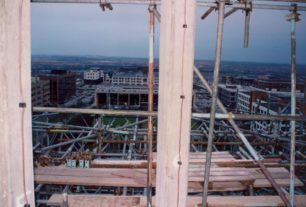 View from the top of Christ the Cornerstone Church during construction, CMK. 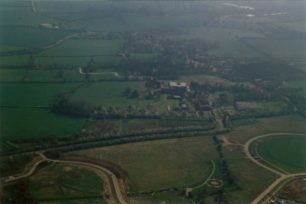 Looking south along V7 towards Saxon Court. 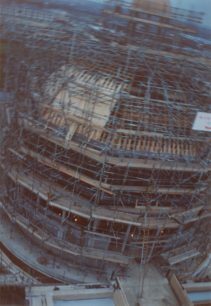 View of CMK Library from top of Christ the Cornerstone Church during construction. 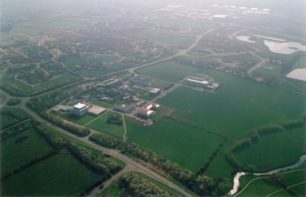 View from helicopter of an existing farm in the Milton Keynes area. 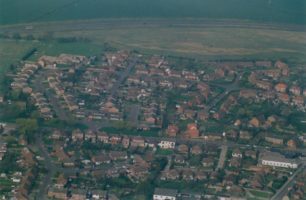 View from helicopter of unidentified housing. 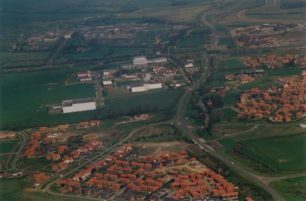 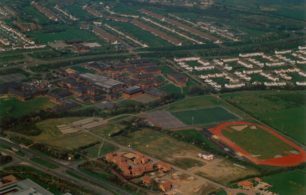 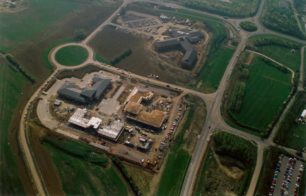 Aerial view of Hoechst, the Open University and surrounding housing estates.